2010.08.24: During the first day of the Introduction to Computer Science class, I asked the 26 students the following question: How many of you use Twitter? My question prompted some gentle giggling, but a couple of hands were raised. I shared with the class about how I’ve been trying to turn students on to Twitter, but that my current grade would be an F-. I shared with the class that for me the power of Twitter was in whom I followed. I told the class that the first thing I do when I log into my computer is scan my un-read tweets. I pointed out that if the “right” people are followed, then Twitter can be a treasure trove of great stuff. Student (sitting in row one): Give us an example. Me (excited): Did I pay you to say that? Me (yet more excited): Yes. Do know about Doug Engelbart? Student: Yes, he invented the computer mouse. Student: I learned it last semester from Peter Martin. Engelbart was his idol. I click on @hrheingold and we see (which at that time was) Heingold’s most recent tweet. Thank you! @jimmy_wales for great interview on collaboration. Will publish video eventually. Wow! Look at that… It appears as though Howard Heingold has interviewed Jimmy Wales and he’s going to share the interview with the world. Question to the class: Who is Jimmy Wales? There’s a pause, so I tell the class that if they use the Wikipedia, then they should give thanks to Jimmy Wales. I also point out to the class that they too can follow @jimmy_wales on Twitter. I point out the class that the power of Twitter is significantly amplified by the ability to insert hyperlinks into tweets. Hyperlinks make the web the World Wide Web (WWW) that it is. But well before the WWW (almost 30 years before), one technologist was thinking about hypertext. Question to the class: Whom do think this technologist was? “It felt like having Newton and Galileo over for dinner,” wrote Howard Heingold on having dinner with Engelbart and Nelson. At this point, this power of Twitter example is over. With one tweet I was able to introduce Ted Nelson and Doug Engelbart to the students in an introductory Computer Science class. In addition, the students were introduced to Howard Heingold and Jimmy Wales. Doh! It turns out this power of Twitter example isn’t over. On 2010.08.26 (i.e. day two) of class, the following was presented. Let’s rewind three weeks to a tweet by Mitch Kapor. Observe… Mitch Kapor hyperlinked into the Wikipedia. All of the web is in essence a pale shadow of just one of Ted Nelson’s dreams. Now do I have your attention? 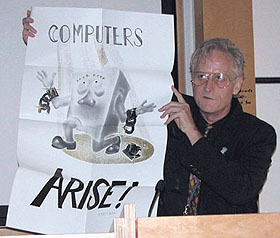 I’m going to make sure my CS1 students learn a bit about Ted Nelson this fall. They’ll come in knowing Gates & Jobs, but not Nelson. where should the Nelson-newbie start? I was reading what some psychologist had to say about Facebook and Twitter and the following quote caught my attention. I understand Dr. Alloway to an extent; however, tweets can contain hyperlinks that in turn, if clicked, take us to a constantly growing world wide web of information. In other words, tweets can exploit the power of the hyperlink. I think of tweets as expanded headlines/titles/subject-lines and the effective use of these communication objects can be a powerful tool. In a nutshell, for me right now, the power of Twitter is in who I follow.